Charters Towers, an inland rural city founded on gold mining, is 110 km south-west of Townsville. The Charters Towers gold rush of the 1870s saw the town become a major mining and business centre. The landscape was soon covered with mining and processing mills. Grand commercial buildings and private schools gave the town such presence that its inhabitants dubbed it 'The World'. With subsequent population decline many of the grander structures have survived. The Charters Towers region is drained by the Burdekin River which Ludwig Leichhardt encountered in his overland expedition in 1845. In 1859 George Elphinstone Dalrymple set out from Rockhampton on a land assessment survey, and his report led to tenders being invited for pastoral runs in the Burdekin district. 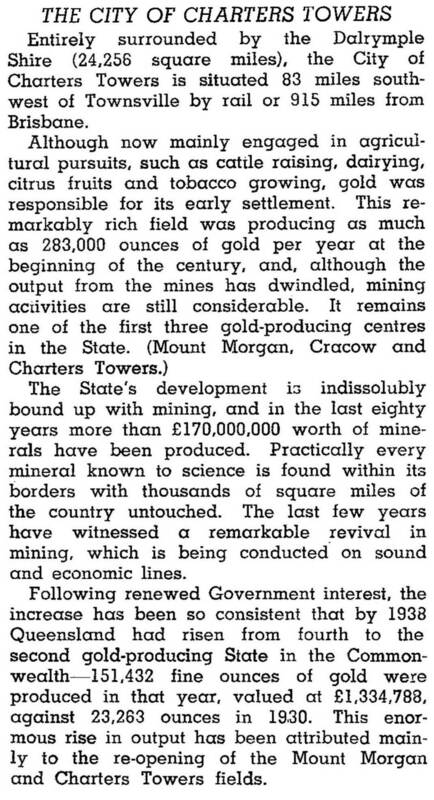 Within a few years gold was discovered on the Upper Cape River, south-west of the future town of Charters Towers. William Charters was appointed goldfields commissioner in 1867 as a rush of miners arrived from Bowen and Townsville. In the following year gold was found north-east of the future Charters Towers at Ravenswood, which by 1870 was a boom mining town. Closer to the site, gold was found at Broughton in 1871. In January 1872 an Aboriginal youth, Jupiter Mosman, stumbled on gold near Towers Hill, a prominent rocky rise 1.5 km south-west of the centre of present-day Charters Towers. Jupiter was the servant of Hugh Mosman, a victim of a Queensland pastoral slump trying his luck at Ravenswood. The son of Archibald Mosman of Mosman's Bay, Sydney, Hugh later successfully participated in several mining ventures and became one of the social lions of Charters Towers. He named the gold find Charters Tors, after the goldfields commissioner and the likeness of the rocky outcrops to south England tors. Tors became towers soon afterwards. Mosman is remembered in the town's Mosman Street. Gold was also found about 4 km south-east of Charters Towers on the Millchester Creek, which was known as Lower Camp. The presence of water attracted miners to Lower Camp, but as leads petered out they returned to Upper (Towers) camp. In 1872 a Catholic chapel was opened there and the Charters Towers Miner (later the Northern Miner) was first published. Millchester continued to be an important place of settlement. The district's first Church of England, school of arts and primary school were all opened there is 1874. The handbook's reference to Charters Towers not answering miners' expectations coincided with an exodus to the Palmer River goldfields between Cairns and Cooktown. Nevertheless, the rich St Patrick Block was found in 1876 and by the end of 1878 there were 12 ore processing mills working in the district. Several of them, including the Venus (1872-1972), were at Millchester Creek. Charters Towers was made a municipal borough in 1877 and it was connected by railway to Townsville in 1882. There was spectacular growth during the 1880s, with annual gold production during the decade nearly doubling. 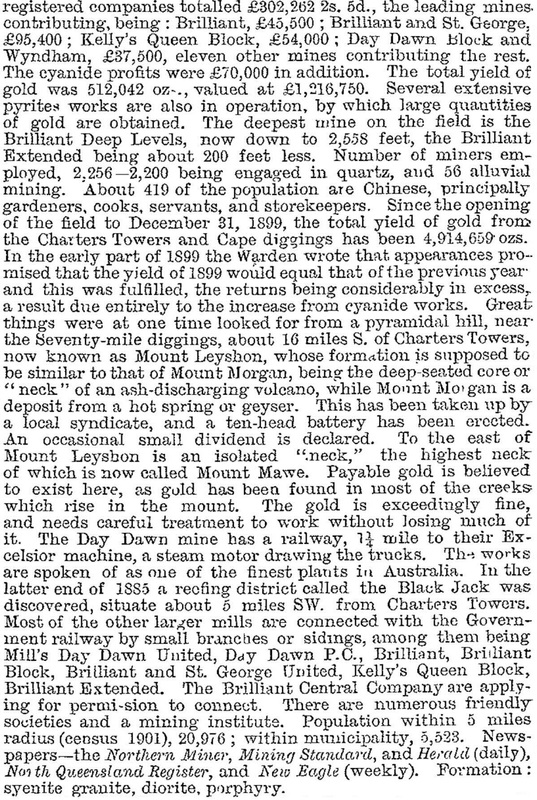 The 1892 amount of 217,000 ounces was double that in 1888, owing chiefly to the remarkable success of the aptly named Brilliant mine. During the following decade, when most of Australia was in financial depression, production continued at about the same level or better than the 1892 figure. The use of cyaniding from 1892 extracted additional gold from the thousands of tonnes of mine tailings. By 1890, Charters Towers was Queensland's second largest town. Its confident inhabitants not only thought of it, but called it, The World. In that year a stock exchange started trading in Mosman Street. The first of several private schools, St Mary's Catholic primary, was opened in 1892, and a Catholic boys' school, Mt Carmel, in 1902. There were also by then Wesleyan, Methodist, Presbyterian, Lutheran and Salvation Army places of worship, along with a hospital (88 beds), gas and electricity supply, several banks, numerous friendly societies and a school of mines. Gold output exceeded 300,000 ounces in 1899, but mine safety was inadequate. Queensland's second ambulance (QATS) depot opened in Charters Towers in 1903, a grand two-storey structure in Gill Street, proving its value in a dangerous fire at the Brilliant mine in 1904. In 1907 the town was proclaimed a city. A State high school was opened in 1912, followed by a Methodist/Presbyterian Boys' College (1919) and Girls' College (1920), and Church of England boys' and girls' schools in 1921. All had boarders and day students. By this time gold output was declining from under 100,000 ounces in 1912 to under 9000 ounces in 1920. However, the city was already established as a regional centre. In fact, modern methods revived mining at locations up to 65 km from Charters Towers in the 1990s, including an open cut at Mt Leyshon, 24 km south of Charters Towers. In 2001 mining accounted for 12% of total employment. Charters Towers became a major heritage centre. With its rich legacy of buildings from the mining era, its commercial and retail precinct is classified as a conservation area in the Australian heritage register. Sixty buildings of significance are in the conservation area, including the Stock Exchange, Post Office, Court House, Police Station, Australian Bank of Commerce and Lissner Park. Eight hotels continue in Charters Towers. Somewhat surprisingly, accommodation and hospitality provided only 5% of employment in 2001. Wholesale and retail employment were 20%, education 13.5% and health and community services 11.6%. Charters Towers is the regional centre for the local government and draws school boarders from northern Queensland and beyond. There are a regional broadcasting station, 4GC, a domestic airport and a tropical weeds research centre. Several historic buildings have been refurbished and put to new uses. Chief among these is the World Theatre complex in the former Australian Bank of Commerce, with a performing arts theatre, two cinemas and meeting rooms. The Stock Exchange building is a mining museum and the Venus Battery at Millchester is substantially preserved as a heritage site. Extreme measures, including helicopters, sirens, fogging machines and firing of gas guns, have been used over the years to remove a bat colony from Lissner Park. There are numerous state and private schools in Charters Towers. Those in the central area are the state primary and high schools (1875, 1912) and a TAFE. The other schools outside the central area are mentioned in the Charters Towers suburbs entry. At the 2011 census education was the largest employer with 11.9% of the workforce followed by mining (8.8%), local government administration (5.2%), hospitals (4.9%) and cafes, restaurants and take-away food (3.8%). Aboriginal and Torres Strait Islander people made up 10.1% of the population. Dalrymple Shire had its offices and a cattle saleyard in Charters Towers. In 2008 the shire and town council were amalgamated to form Charters Towers Regional Council. 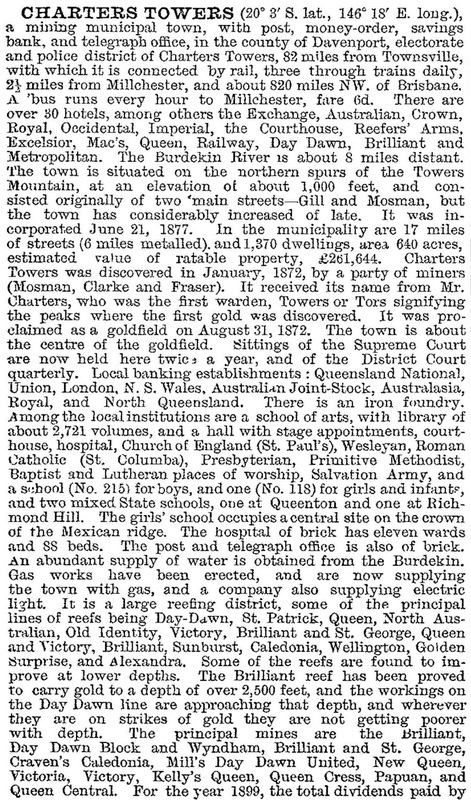 'Souvenir - Charters Towers, 1872 to July 1950'.